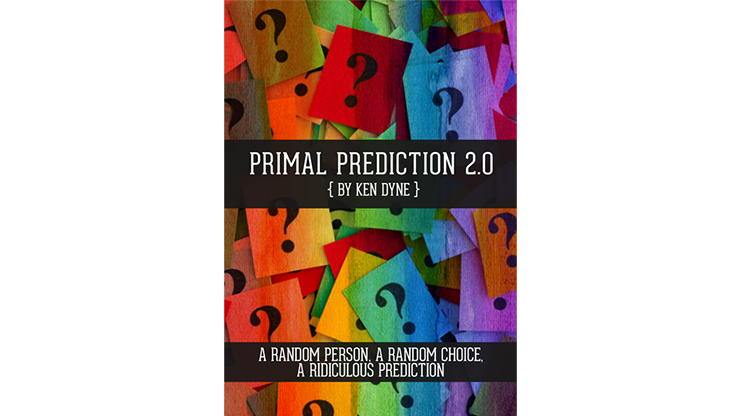 "Primal Prediction 2.0 is a practical, easy to do, hard-hitting effect with no angle restrictions. It has room for personality and humor and is flexible in presentation as you can use colored envelopes or write/draw whatever you'd like on them. You'll hear people saying "No way... No way!" throughout the reveal of your final prediction. This is a worker that can easily fit into almost any show to add some solid, head-scratching entertainment." Also included in this edition are suggestions from Ken's friends, Nique Tan and Adam Kordecki, which include fantastic scripts for alternate handlings. You do NOT need to be familiar with the original Primal Prediction - so if you missed that back when it was available, don't worry. This is the complete treatise from start to finish. 10 years can do a lot for an effect. Especially when you're performing it 2-3 times per week. That's what's happened with Primal Prediction. Ken originally wrote Primal almost 10 years ago now and since then has continued to use it in almost every performance he gives. As you can imagine, this has given him a really deep understanding of the routine, which has lead to some other huge developments and discoveries. ONE EFFECT: At the beginning of your show, you select someone at random to make a choice of one of three colored envelopes (red, blue or green). The envelope of their choice is handed to them and they're asked to keep considering their choice throughout the rest of your performance. At the end of your show, you ask the person with the envelope to stand and make their final decision. Keep the envelope or swap it for another one. Whatever their choice, the envelopes on stage contain large printed messages saying, 'Do NOT Pick'. However, when the lady in the audience opens her own envelope (she opens it herself), it contains a surprise prediction of many of the things that happened during the show, choices that were made (including completely free choices with no forces), ending with a full physical description of exactly how she is dressed! This has been part of Ken's show for more than 15 years now and it is an incredibly strong, jaw-dropping effect which relies on multiple principles woven together to make this completely impenetrable. Suitable for groups as small as 6 and plays wonderfully on stages for thousands. Just 3 ungimmicked envelopes and some ordinary pieces of paper. All kinds of magicians and mentalists around the world have been using the original Primal Prediction in their show for years and now you can finally get Ken's complete thoughts on the true potential of this incredible performance piece. The popularity of the effect down to its incredibly high-impact climax, its simplicity to 'set up' and perform, and the fact it folds completely flat - it's 3 envelopes! Plus you can easily theme this to your group. Inside there's additional material from Colin McLeod, Adam Kordecki, Nique Tan and now a bonus video from Patrick Gregoire too. "The method is genius and unlike a lot of slow, boring mentalism that you see a lot, this a highly entertaining routine that I've already had great reactions from. Ken's years of performing this are obvious through the experiences shared inside - Primal Prediction is a hugely underpriced real-world working routine."